You guys, I loved reading the comments you left about our cute little peanut – it’s apparently true, a mom can never hear (or read) enough about how adorable her kid is. :) So thanks! Last week I showed you what the flip looks like, but I thought you might be curious about the layout and the changes we plan to make to it. Above, you can see the original floor plan – I know it’s a little small, so just click on it to see a larger image if you’d like (then use your “back” arrow to get back here). As you can see, the house is big!! Below are the changes to the floor plan that we already have in progress. What used to be the formal living room will now become sort of a butler’s pantry, bridging the gap between the kitchen and dining room with lots of useful goodies – a built-in desk area and then a beverage center like the one at our house that will be great for entertaining. We went back and forth with a zillion ideas of how to use this space (more on that later) and we hope this is the right call! 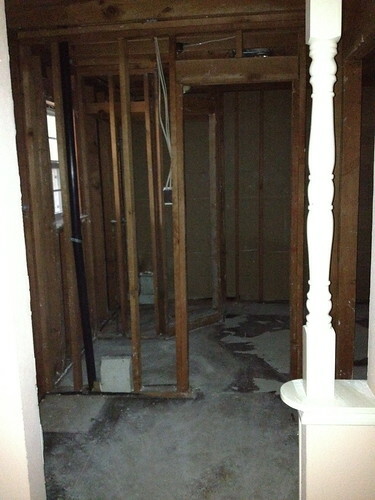 The wall between the formal living room and the breakfast room is gone now – yay!!! The space already feels so much more open. The kitchen has obviously been gutted, and we also widened the opening between the breakfast room and the family room and plan to add a peninsula in the kitchen on that wall perpendicular to the fireplace (does that make sense?) instead of the hutch that was previously in that space. The half bath off the laundry room just didn’t work for us – there’s no way anyone would send their guests through the laundry room to use the bathroom, and the only other accessible bathroom was attached to the master. Since we want the master bath to be private and we’re closing off that doorway to the hall, that meant all guests have to use the 1/2 bath in the laundry room – no bueno. Because of that, we chose to turn that half bath into a pantry and make a new half bath off the hallway, taking in the hall closet and part of the master bathroom. Problem solved! By closing off the door to the hallway and making the master bath private, we created a new problem – that fourth bedroom no longer has access to a full bath. After lots of deliberations (more on that later – I’ll do another post about the other floor plans we considered), we decided that the fourth bedroom would become a study (it already has tons of built-ins) and the new owners could use it as a bedroom if they really want. Was that the right call? I guess we’ll see. 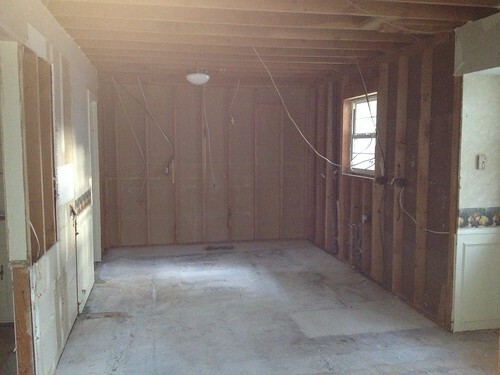 The only other big change to the floor plan is the master bath – it’s getting a huge switcheroo. We lost some space to the new half bath but we gained space by incorporating the dressing area, so we have room for a giant double vanity and an even more giant two-person shower (so excited about that one!!!) and a big toilet closet and lots of closet space. I think it’s going to turn out really nicely. So now you know how we’re changing the floor plan at the flip! What do you guys think? Wow! this one looked like it had a lot of things going on to consider! I think you made the right choices. I’m sure a new homeowner will love it! You could also call the new study a nursery – since those wouldn’t typically need direct bathroom access. My parents had one like that in their house until they turned the entire room into a closet! I love the new plan, everything should feel so much more open and flow better! Cant wait to see as it progresses! Thanks Christy, my fingers are crossed that it turns out that way! Wow that is going to look incredible when it’s done…keep posting progress! Good eye, Karen!! Yes, we did consider that, very seriously in fact. In the end we decided against it because it would have required moving the hot water heater (it’s actually not a linen closet) and totally gutting that bathroom, whereas now we’re just giving it a serious facelift. 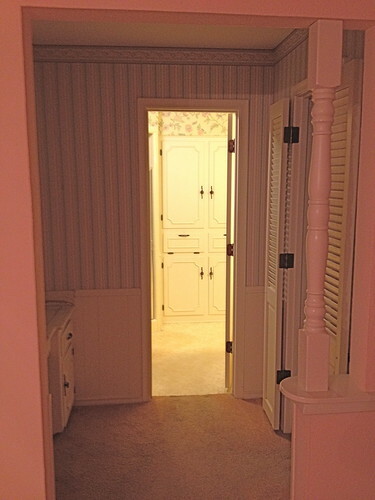 Also, we worried that the hallway would have felt like a tunnel (it would have to run pretty far) and that 3 doors into the little bathroom might feel crazy. I think it’s all GREAT! I’m sure you are thinking about this – but you lost the formal living room, right? So only one place for couches? We have two sets of couches so I’d be bummed about that. BUT, I wouldn’t necessarily want a formal dining room (even though we currently have one – I’d like to transform it to a play/arts and craft space) so they could use that as one. Anyway, looking great as usual. LOVE these detailed posts and look forward to more. And more pix of the beautiful peanut, of course!!! Great floor plan. Moving that linen closet is probably a good idea but then it looks like it could bring in other problems. The way everything else is laid out looks really good. Very impressed. 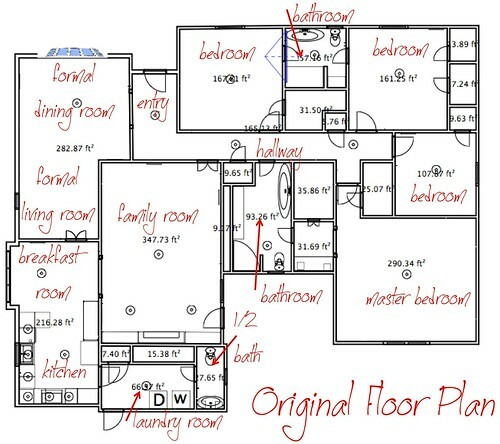 Your floor plan is a great detail to share. I will bet that when you are putting your finishing touches, you will get some better ideas. Just go with the flow and enjoy the whole process! 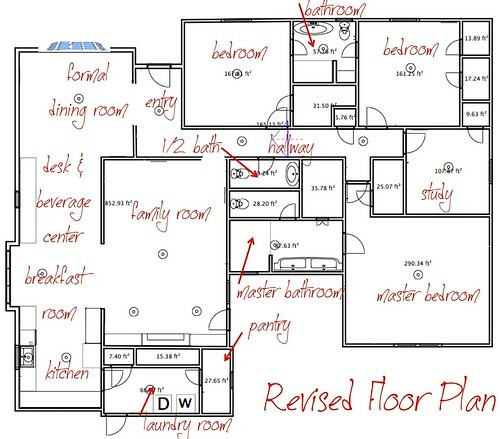 Wow – you really helped that floorplan! It just has such a better flow now. I just know it’s going to be awesome. 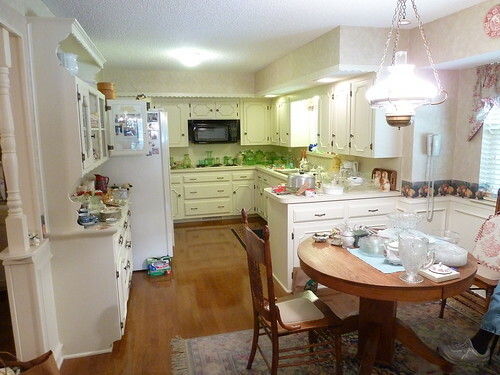 I don’t think there’s a huge difference in 4 bedrooms vs. 3 plus a study. I personally would rather have the 3 beds and have the bathrooms makes sense. I wouldn’t worry about the buyer pool on your decisions. You’re really doing this house right for today’s lifestyle. Wow, you guys are amazing – and inspiring! We are on our very first flip, and pretty nervous, hoping we are making all of the right decisions. We are also tracking our progress on http://www.pardonoursawdust.com. We are living in this house while we work on it, which hopefully we will not have to do in the future. Thanks for sharing, I love reading your blog!